Kwara State is located half-way between Lagos and Abuja. Ilorin is the next big town. The area is largely covered with forest and still offers pristine nature beside agricultural land. A mostly agricultural state where deliciously pure honey can be bought on the roadside without fearing it is cut with sugar or other substances. It is part of Yoruba land. I stayed at the "Top-most Hotel" of the fringe of Oro town. Basically a compound with light colour - painted bungalows, in good shape. I was the only visitor but could have dinner at the restaurant served by two teenaged-girls very excited about my presence and very talkative too. A boy also joined them in the conversation at the end of my chicken and chips dinner washed down with some german-named not so good beer. The most talkative waitress had been living in Lagos before. She was forced to come to Kwara state after her father died. She came back to live with her maternal family. She is a secondary school student during the day and a waitress during the evening and the night. So too was the other girl. The waitress confessed that she loved Lagos and hated Kwara people for their conservative narrow-mindedness, she loved wearing leggings which were perceived as very daring for a teenaged-girl. In Lagos she said no-one would have bothered looking at you. As Kwara is mostly covered by forest, people regularly eat game meat that they hunt. In a restaurant, we met a man who used to have a prominent position locally and he talked about visiting a nearby waterfall which is set in a nice remote place. He was blaming the government for not investing in developing the place for tourism. I imagined, as he was saying it, that the pristine place we were visiting could be turned into a fun park made of concrete and soon littered with plastic that no-one would even consider as a nuisance. Perhaps it was a blessing that development had been postponed. The waterfall was not the reason why I wanted to visit Kwara state. 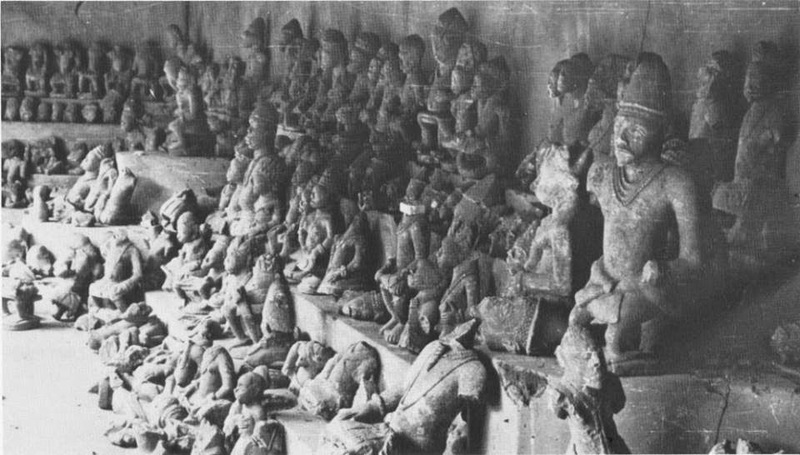 I actually wanted to visit a national museum located in the town of Esie which hosted a collection of perhaps 1500 soapstone statues which are a mystery to everyone. There is the local explanation for them and also the scientific version but none of them seem really satisfying. They are kept in a patio style inner courtyard. The figures were found at the end of the 18th century arranged in circles around a tree and looking at a dignitary. What is extraordinary with this figures is the incredible richness of variety of features used to make each of them unique and from a distinct origin. It is as if emissaries from all over Nigeria had been gathered in an assembly. I was told about the local legend. Following the death of a king, there are several things that are taboo including eating some specific food and leaving the area until the new king is nominated. The elders discuss who should the next king. At that time, the likeliest candidate was very sure of himself and decided to break rules by engaging in a taboo. The next day the whole habitants of the village had been turned to stone which would be the statues we now see. Obviously this does not tie-up with the diversity of features observed on the figures but this is what locals seem to believe.